All the fighters slated to participate in tomorrow night’s “UFC 142: Aldo vs. Mendes” event tipped the scales Friday inside HSBC Arena in Rio de Jenairo, Brazil. BREAKING NEWS: UFC president Dana White reported prior to the festivities that Anthony Johnson is way overweight and Vitor Belfort will get 20 percent of his purse. White was PISSED. 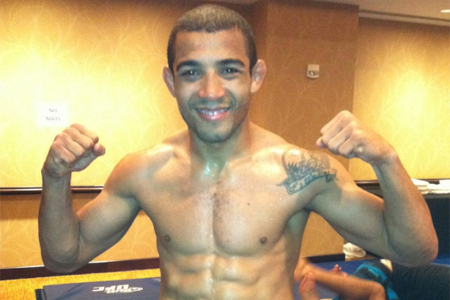 Saturday’s pay-per-view broadcast features a featherweight title tilt between champion Jose Aldo (Pictured) and Chad Mendes. A middleweight shootout with Vitor Belfort and Anthony Johnson will serve as the co-main event.